First thing to know is that this treaty will be effective only after at least 50 countries ratify it. Not so easy at all, but it’s still doable. I’ve got a lot of doubt about the choice that this treaty will be ratified in the USA, for istance. With all the fuss the NRA is raising about “gun control” laws and procedures it’s easy to say that this will become another political battle inside the Congress. A lot of other countries, including Italy, will wait and see what’s going on in the USA. Another question to be considered is: who will enforce violations of this treaty? For instance, who will go head-to-head with China for its controlled weapons selling in Africa? An inapplicable treaty is nothing more than hot air, we all know that for sure. What kind of controls can be set up for the little productions worldwide? Nowadays we can see every day on TV that Syrian rebels got themselves a cache of small weapons made in Croatia, it’s not so hard to load a container or two on a ship, are we gonna control every single ship? The UN treaty is still good news, no doubt. But if you think that a piece of paper will stop that kind of trade, better think twice. 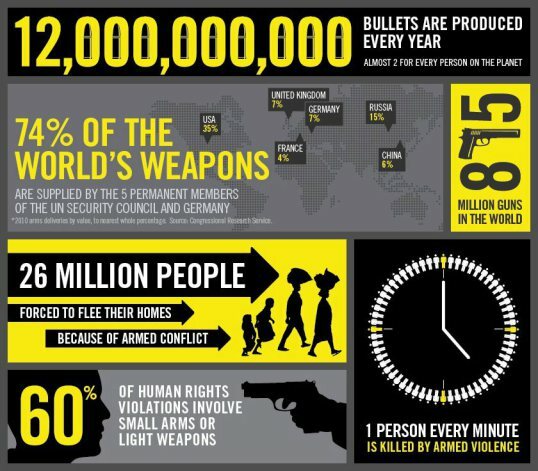 The only way to stop weapons smuggling or illegal sell-out of weapons is to set up massive measures. That means boots on the filed, no less. Weapons to stop weapons. Complimenti per il tuo cinquecentesimo post!